The surest way to find the best short-term performance is to chase winning sectors, so most professional money managers are momentum players. When they see outsized gains, they are quick to deploy their investors’ capital to partake. And that’s led them to gold stocks. In the first half of 2016, the flagship HUI gold-stock index rocketed 121.8% higher compared to a mere 2.7% gain in the benchmark S&P 500 index! With such epic results, even relatively-small gold-stock allocations in portfolios can really boost their overall gains. So following the successful Brexit vote in late June that reversed gold sharply off lows, fund managers started flooding into leading gold-stock ETFs. These capital inflows accelerated into the end of Q2 on window dressing, where fund managers buy a quarter’s winners before they report to their investors. These money managers believe reporting that their funds own high-performing stocks in their quarterly updates make them look smarter. But window dressing is deceptive, since funds buying a quarter’s best performers at quarter-end didn’t actually reap their big gains! With gold stocks now firmly on fund managers’ radars, their heavy ETF buying continued in the initial days of Q3 as they put new capital to work. Like most ETFs, gold-stock ETFs track underlying indexes. Thus when a gold-stock ETF sees a big surge of differential buying from fund capital inflows, its shares threaten to decouple from its index to the upside. So to maintain tracking, the ETF managers have to issue enough new ETF shares to offset that excess demand. They then use the proceeds to buy shares in the actual underlying gold stocks they own. Because 2016’s new gold-stock bull has been driven by heavy fund buying of ETF shares, the gold stocks owned by the leading ETFs have enjoyed the greatest gains. While nearly all the world’s biggest and best gold miners’ stocks are included in these ETFs, the ones that aren’t are really underperforming their peers. For better or worse, ETFs are how most investors and fund managers choose to own gold stocks. The leading gold-stock ETFs are the GDX VanEck Vectors Gold Miners ETF for the major gold miners, the GDXJ VanEck Vectors Junior Gold Miners ETF for the smaller miners and explorers, and the SIL Global X Silver Miners ETF for the silver miners. The companies that these ETFs own have seen some of the best gains in 2016, as ETFs have to spread their capital inflows proportionally across their holdings. But is this amazing gold-stock surge sustainable? There’s definitely still vast room left for professional money managers to add gold-stock exposure in these leading ETFs. As of this week, GDX, GDXJ, and SIL had total net assets of just $10.7b, $4.2b, and $0.4b! These are rounding errors compared to the vast sums of capital invested in funds, so overall fund exposure to gold stocks via these ETFs is still close to zero. All this heavy fund buying in recent weeks has certainly left gold stocks very overbought on a short-term basis. So if the money managers scale back their big capital inflows, that will probably result in a considerable pullback or correction. But from anything beyond a near-term perspective, the gold stocks don’t look toppy at all despite their extraordinary surge so far this year. Their new bull remains quite young. This first chart encompassing the last few years or so helps put gold stocks’ blistering recent-weeks surge into perspective. It looks at that leading HUI gold-stock index, which is closely mirrored by GDX. Using the HUI for any technical analysis beyond a few months is preferable because this index doesn’t have management fees. GDX’s managers are paid a 0.52%-of-assets fee annually, slowly skewing its results. The flagship HUI gold-stock index has skyrocketed a truly-astounding 169.9% higher in just 5.6 months since mid-January! That certainly sounds ridiculously extreme in isolation, but context is crucial here. The HUI had been bludgeoned to fundamentally-absurd 13.5-year secular lows in January. The gold stocks were trading as if gold had utterly cratered to $305, yet it was actually 3.6x higher near $1087. I wrote an essay that very secular-low week pointing out the fundamental ridiculousness of that pricing anomaly, urging investors to aggressively buy gold stocks just as we and our subscribers did. With this sector never trading lower relative to the price of gold which drives its profits, there absolutely had to be a massive mean reversion higher. That’s the whole story of gold stocks’ new bull, an unwinding of extreme fear. Last summer a major gold-stock uptrend off deep secular lows suffered an anomalous breakdown after extreme gold-futures shorting sparked panic selling in gold stocks. Up until gold stocks’ sharp post-Brexit surge in recent weeks, all they did was regain that late-2014-early-2015 uptrend channel that had been unrighteously shattered. Gold-stock prices still remained extraordinarily low in the grand scheme. 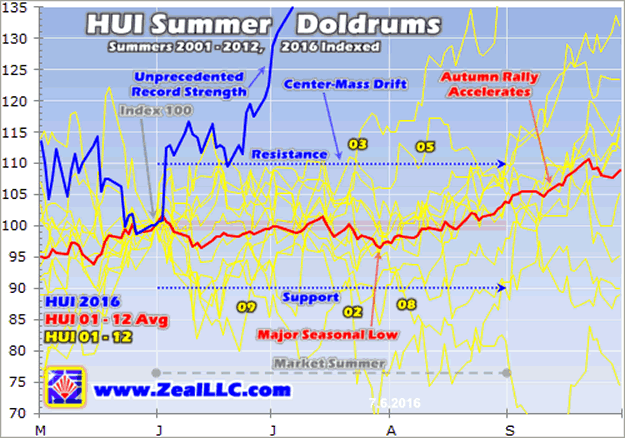 After soaring dramatically into late April, the HUI consolidated high within that old uptrend between then and late June. That consolidation trading range ran between roughly 200 and 240, far above the 100 secular low of mid-January. It wasn’t the Brexit surge that broke gold stocks out of this consolidation, that only pushed the HUI back up to 240 resistance. This sector’s rare summer breakout came a week later. Starting on the last 2 trading days of June and Q2, and continuing in the first 3 of July and Q3, funds poured capital into the leading gold-stock ETFs. They were likely window dressing their portfolios before reporting to their investors at the end of last quarter, then deploying fresh capital into gold stocks at the start of this quarter. This catapulted the HUI 14.9% higher in just 5 trading days as of this Wednesday! Such a big, decisive breakout is radically unprecedented in the summer months. June and July have always been gold stocks’ weakest time of the year seasonally. Before we dig into that though, these fund-ETF-buying-driven gold-stock levels simply aren’t extreme. The HUI was merely trading at a 2.9-year high in the middle of this week after all that surging! That’s far from an ominous major secular peak. But with the HUI stretching 70.0% above its 200-day moving average, gold stocks are definitely very overbought on a short-term basis. But such overextendedness just portends a short-term pullback or correction. Back at the end of April, the HUI had rallied so far so fast that it had soared 73.8% above its 200dma. These are very extreme readings by any measure, far beyond anything normally witnessed! Yet the gold stocks didn’t collapse out of that epic late-April overboughtness. While the HUI suffered a healthy 14.8% correction over the next month or so that bled off late April’s excessive greed, that was just part of a larger high consolidation. That sideways grinding not far off gold stocks’ recent super-overbought peak laid the technical and sentimental foundation from which this past week’s major breakout launched. While that heavy gold-stock-ETF buying by money managers has left this sector very overbought again, gold stock prices are still relatively low. They have merely regained the already-low levels of recent years prior to last summer’s anomalous breakdown. So although gold stocks face another consolidation or correction from these latest super-overbought levels, that’s probably the full extent of their near-term risk. Now with today’s overall gold-stock-ETF holdings still so utterly trivial compared to the trillions of dollars of capital the fund industry controls, money managers inarguably have vast gold-stock buying left to do. If they want any meaningful overall-portfolio boost from these new precious-metals bulls, they are going to have to raise their almost-nonexistent exposure dramatically to at least 5%. That will take huge buying. So it’s tempting to expect the torrid capital inflows into gold stocks seen in the past week to continue. But that’s really unlikely. Window dressing only happens at the end of quarters, and it’s a long way to the end of Q3. And early-quarter deploying of fresh capital from investors peaks early in quarters, as the fund managers rush to put this money to work as quickly as they can. They aren’t paid to just sit in cash. Thus while fund gold-stock-ETF buying will indeed likely continue in the coming months and years, it can’t stay as intense as it’s been this past week. Markets, and capital flows, are forever cyclical. Gold-stock prices naturally flow and ebb just like everything else in the markets. And following such a blistering surge, the near-term gold-stock downside risk is considerable. Especially in the middle of summer. This next chart looks at gold stocks’ summer performances per the HUI in the bull-market years between 2001 and 2012. Between November 2000 and September 2011, the HUI skyrocketed 1664.4% higher in that 10.8-year secular span! So if there were ever summers where gold stocks should’ve performed strongly, those were it. Yet the radically-unprecedented record strength we’ve seen this summer dwarfs them. I discussed these summer-seasonal charts a couple weeks ago, but here’s the gist. Each year between 2001 to 2012, and 2016, has the HUI indexed to its final close in that particular May. That’s set at 100, with all price moves recast off it. A HUI level of 105 is up 5% from its May close, for example. Each year between 2001 to 2012 is shown in yellow, and their average in red. This year’s HUI action is rendered in blue. Between the end of May and the middle of this week, the HUI has soared 35.0% in 5 weeks! That is so far beyond unprecedented even in the mightiest of bull-market years that it defies belief. As this chart reveals, no other modern bull-market summer has even come close. 2016’s gold-stock performance in June and early July is in a league of its own. The sheer anomalousness of this summer breakout is concerning. Normally the gold stocks as represented by the HUI meander in a boring sideways grind in June and July between about 10% below to 10% above their May closes. By July’s third trading day, which was this Wednesday, the HUI averages a 0.9% loss from its May close. So to see it 35.0% above the levels where it entered summer is mind-boggling. Even on a short-term basis, extremes beget mean reversions. On average, gold stocks see a major seasonal low in bull-market years in late July 3.6% under their May close. Historically this late-July timeframe has proven the best time of the summer to add new gold-stock positions. The gap between where the HUI is today and where seasonals argue it very well could be in a few weeks is massive! Gold stocks’ downside risk in the summer doldrums is serious from today’s lofty levels. So odds are gold stocks will at least suffer a pullback and quite likely a full-blown correction exceeding 10%. Remember that the last time gold stocks were so overbought in late April, the HUI fell nearly 15% in the subsequent weeks. Money managers could short-circuit this natural sentiment rebalancing if they keep migrating more capital into gold stocks by selling some of their other holdings, but that’s fairly unlikely. But even if this extreme outsized record early-summer strength naturally mean reverts to late-summer weakness, this young gold-stock bull is far from over. This last chart looks at the long-term picture in gold stocks considered relative to the dominant driver of their profits and hence stock prices, gold. 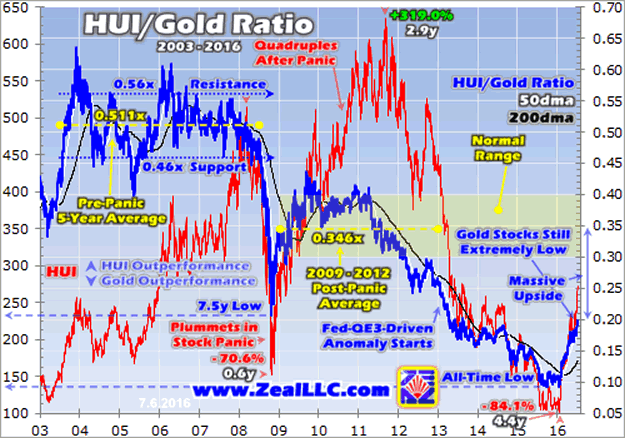 The HUI/Gold Ratio shows how cheap gold stocks remain relative to today’s gold prices, let alone tomorrow’s. Despite gold stocks rocketing higher this year, they still remain very low absolutely and relative to gold. While this week’s 272 HUI may feel high compared to January’s extreme 101 secular low, it is still really low historically. With the exceptions of 2008’s short-lived stock-panic anomaly, and the extraordinarily-weak recent-years action spawned by the Fed’s stock-market levitation, today’s HUI levels are still super-low. Ultimately all stock prices migrate to some reasonable multiple of their underlying companies’ profits. And in gold mining, earnings are almost exclusively driven by the price of gold. Since mine costs are essentially fixed in the planning stages when ore bodies are targeted and extraction methods defined, they generally don’t follow gold prices higher. Thus profits leverage and amplify moves in gold itself. The HUI/Gold Ratio is a great proxy for this critical fundamental relationship between the gold stocks and the metal they mine. As of this Wednesday after all that heavy fund gold-stock-ETF buying, the HGR hit 0.199x. In other words, the HUI close was running about 20% of gold’s own close. While this was up 115.1% from the HGR’s all-time low of 0.093x in mid-January, it was still merely a 2.9-year high. Recent years’ dismal gold-stock price levels were an extreme anomaly driven by Fed-levitated US stock markets, which crushed demand for alternative investments led by gold. Investors shunned everything but the endlessly-rallying stock markets, driving gold stocks to much-lower levels relative to gold than even those seen during 2008’s first stock panic in a century. Such extreme gold-stock pricing wasn’t normal. Back in 2009 to 2012, the post-stock-panic years before the Fed ramped up its unprecedented open-ended QE3 campaign which levitated stock markets, the HGR averaged 0.346x. A mean reversion back up to these levels at $1300, $1350, and $1400 gold yields HUI targets of 450, 467, and 484. That’s another 66%, 72%, and 78% above this week’s summer-breakout levels, implying big gains likely from here. And these mean-reversion gold-stock-bull targets are very conservative. Once price levels are forced to extremely-anomalous levels, the subsequent mean reversions in the opposite direction never stop at the means. Instead they overshoot proportionally to the other extremes. So gold stocks are almost certain to see far higher levels relative to gold than in that post-panic-average period. Pre-panic levels are actually likely. In the long 5-year secular span between mid-2003 and mid-2008, the HGR averaged 0.511x. A mean-reversion overshoot back to there at $1300, $1350, and $1400 gold would yield HUI targets of 664, 690, and 715 which are 144%, 154%, and 163% above today’s levels! And this assumes gold itself isn’t going higher, which is silly given the massive investment buying gold has seen in 2016 as portfolio allocations rise. Today’s gold levels are also relatively low compared to modern precedent. Back in 2012 for example, the last normal year before the Fed’s QE3 radically distorted the markets, gold averaged $1669. The HGR-implied HUI targets at those post-panic and pre-panic average levels with 2012 gold prices soar to 578 and 853! That’s 113% and 214% higher than this week’s latest HUI peak driven by heavy gold-stock-ETF buying. So no matter what happens in the near-term, gold stocks’ bull-market upside from here remains vast. 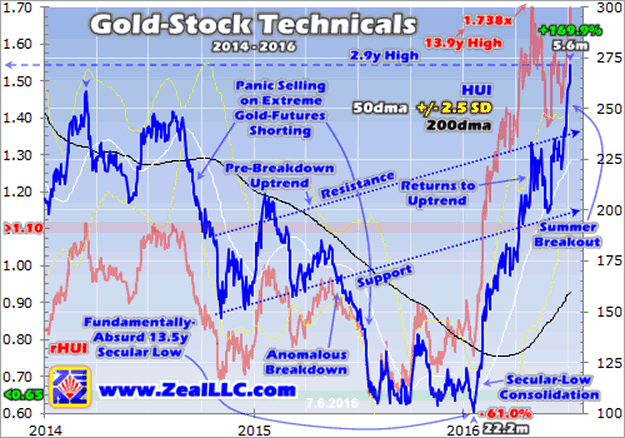 Gold-stock technicals are very overbought, and argue for a consolidation or correction after such fast gains. And the extreme record early-summer strength in gold stocks far beyond anything ever witnessed before certainly ramps the odds that a short-term mean reversion lower is inevitable. Mid-bull selloffs are typical. Not only do they bleed away greed and rebalance sentiment to keep bull markets healthy, but selloffs are a great boon to investors and speculators alike. They offer the best times to add new positions at relatively-low prices within ongoing bulls. Prudent traders know there is no need to chase strong rallies and buy high, because they are always followed by buy-lower opportunities in consolidations or corrections. So if you have existing gold-stock positions, make sure they are protected by trailing stops and enjoy this record early-summer rally. While I’m always wary of summers after decades of hard experience in gold stocks, this year I decided to hold 2/3rds of our wildly-profitable gold-stock trading book into summer in case the massive investment buying pushed gold even higher. I advised our subscribers to do the same. But after such an extreme gold-stock rally counter to normal seasonal tendencies, it’s not wise to chase this sector’s record strength. Whether you are looking to add elite individual gold stocks with superior fundamentals like we own, or one of the leading ETFs like GDX, there’s no hurry. Don’t let your greed and excitement dupe you into buying high. Wait for the inevitable consolidation or correction to deploy! At Zeal I’ve spent literally tens of thousands of hours studying and researching the markets, individual stocks, and trading. Among the many things I’ve learned is the great importance of staying informed. That grants traders the crucial perspective necessary to master their own emotions and actually buy low then sell high contrary to the thundering herd. If you don’t stay abreast of the markets, the battle is already lost. We can help. We’ve long published acclaimed weekly and monthly newsletters for contrarians. They draw on our vast experience, knowledge, wisdom, and ongoing research to explain what’s going on in the markets, why, and how to trade them with specific stocks. They’ve helped our subscribers really multiply their wealth over the years, with all 832 realized stock trades since 2001 averaging outstanding annualized realized gains of +16.7%! For just $10 an issue, you can learn to think, trade, and thrive like a contrarian. Subscribe today before the next big gold-stock buying opportunity arrives! The bottom line is gold stocks have just enjoyed a record early-summer surge. This was driven by heavy gold-stock-ETF buying by professional money managers, who want portfolio exposure to far-and-away the best-performing sector this year. Their resulting quarter-end and early-quarter buying has left gold stocks very overbought in their seasonally-weakest time, greatly ramping the odds of a near-term selloff. Mid-bull selloffs after big moves higher are common, rebalancing sentiment which greatly extends bull lifespans. They offer the best opportunities for traders to add new positions at relatively-low prices. And make no mistake, gold stocks remain super-low absolutely and relative to the metal driving their profits. 2016’s dazzling new gold-stock bull remains young, with years left to run yet before it matures then peaks.